Size: approximate lengths 12", 14", or 19"
Personalized Christmas stockings are a treasured element of the holiday season. Young and old alike love having their own special holiday keepsake. I can knit the personalized Christmas stockings in almost any colors. Traditional Christmas colors are always popular, but other combinations work well too. Consider team colors for the sports fan, or school colors for a teacher. 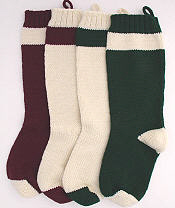 Even red, green, and white can vary to match a personality. Bright jewel tones and rich Victorian shades are both good choices, but each has a very different feel. These Christmas stockings are equally attractive in wool or acrylic. Acrylic has two distinct advantages: it can be machine washed and dried, and it will not be damaged by moths. The colors are typically more vivid. Wool has a higher quality feel, and is the most traditional choice. The colors are usually mellower. 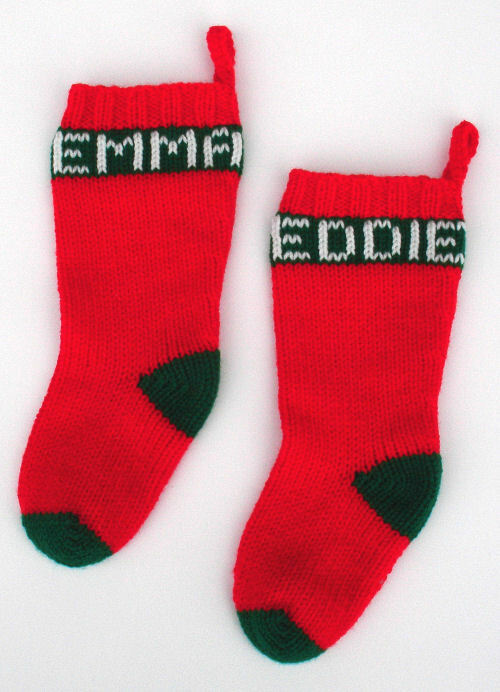 Names are embroidered by hand after the stocking is knitted. I use a method that imitates the knit stitches, so the name appears to be knit in, except that it is slightly raised. The name can be any contrasting color. It is also possible to add words or phrases other than names to your personalized Christmas stockings. Please ask, and we'll see how it fits. Personalized Christmas stockings are a classic Christmas decoration, even if your family doesn't fill stockings. Consider hanging a number of smaller stockings in various colors for a cheerful look. The larger ones can be hung on walls or mantels with special hooks, or simple nails. 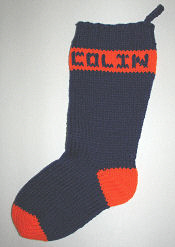 I could also knit an extra-large stocking to be used as a door ornament. The smaller ones could be used as tree ornaments, perhaps filled with candy canes. The medium size is perfect for babies, or for pets. A personalized Christmas stocking is a perfect gift to signal the beginning of new traditions. A new baby, or a newly married couple are both occasions where new family traditions will be set into motion. A date on the stocking can commemorate a special event. The year of baby's birth, or the wedding date, can be added on the banner section or on the leg of the stocking. 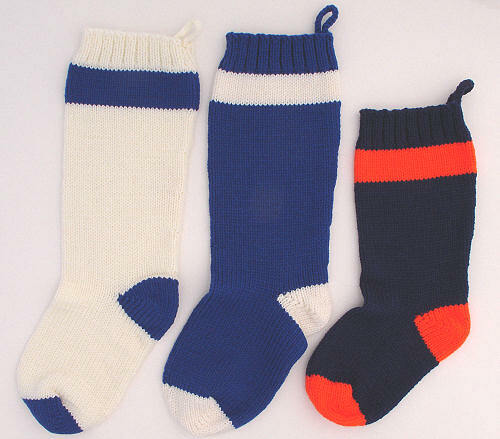 Return to Knitted Christmas Stockings.